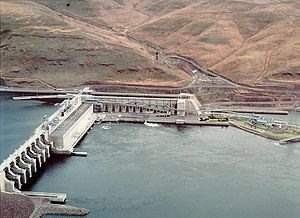 The U.S. Army Corps of Engineers has awarded a $1 million contract to Knight Construction & Supply Inc. to construct a floating barrier across the Snake River above the 810-MW Lower Monumental hydroelectric project. Per the contract, Knight Construction will build a 1,750-feet wide barrier system about 700 feet upstream of the powerhouse and spillway to restrain vessels approaching Lower Monumental Dam. The Corps' Walla Walla District most recently solicited bids for the work in July. It also took bids in June for generator rewinds and turbine cavitation repairs at Lower Monumental. It took bids last year to refurbish thrust bearing shoes at Lower Monumental and 603-MW Ice Harbor dams. For more dam safety news, visit here.